The executives at CrowdFunding Incubator LLC (CFI) project that crowdfunding project sponsors, as well as the website owners and operators, are going to see a change in the attitude of contributors to crowdfunded projects in 2013. Now that the initial fireworks have ended and the real performance data of sites and the entrepreneurs who’ve posted their projects on them are getting closer scrutiny, a shakeup is inevitable. When the credit card bills from Christmas come rolling in, and when some crowdfunding platforms and sites start to post their actual success and failure numbers, prospective contributors are going to be tougher to come by. There is a growing misconception that if you just toss an idea up on a crowdfunding website, money will come running after it. Or the belief that contributors stay up all night scouring the internet for projects they can toss extra money at. This grandiose belief in monetary magnetism is going to cause a lot of crowdfunding project sponsors incredible grief in 2013. The fact is that any venture requires a vigorous and continuous participation on the part of sponsors in promotion. Project sponsors will have to put more of their resources into promotion and building credibility, and this will translate to an improved standard of quality in this new capital market medium. “When the credit card bills from Christmas come rolling in, and when some crowdfunding platforms and sites start to post their actual success and failure numbers, prospective contributors are going to be tougher to come by. They will be more cautious, more skeptical and have less money to gamble with than in 2012,” says Douglas E. Castle, the CEO of CrowdFunding Incubator, LLC (CFI), looking ahead to an inevitable shakeup in the crowdfunding industry. Castle continued by saying, “If anything, entrepreneurs are going to have to do everything that they can to convince an increasingly disenchanted public that their projects will not turn out to be embarrassments, and to persuade the public that contributors, as true believers, will receive some form of compensation, either real or emotional, in exchange for their paid vote of confidence. The notion of just posting up a request for funding on the web and waiting for the money to materialize is disappearing. Now, more than ever since the crowdfunding phenomenon started gaining media traction and public attention two years ago, organizations which require crowdfunding for their capitalization base are going to have to participate actively in the promotion of their ideas. CFI’s Chief Operations Officer, RD Watkins added, “The better crowdfunding websites are going to be getting more choosy about which project promoters they want to rent out their valuable website real estate to. The decision makers who own these crowdfunding platforms are going to be looking very, very carefully at not only the viability of any given project, but they’ll also be looking at how much the project’s sponsors are willing to participate in the promotional process. Castle added, “People are getting educated about crowdfunding. 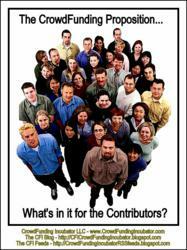 Contributors as well as the operators of the funding sites want to see three things. They want an idea or a business plan that makes sense; they want some kind of consideration in exchange for their contributions of seed or early-stage capital; and they want to see that the innovators and entrepreneurs who are looking to them for funds have some serious skin and sweat in the game. “Projects just don’t fund themselves. In the coming year, the entrepreneurs are going to have to do everything within their power in order to drive prospective contributors to the platforms where their businesses or business ideas are being showcased.